Halfway through our second week in the village I (Susan) came down with a sore throat and cough that just wouldn’t go away. After four days, when my voice was half gone, we (meaning Brian, myself, and three Papua New Guineans who went along to take care of us) decided to drive to Ialibu to go to the haus sik, or hospital. Ialibu is a small town, and the hospital is not very imposing. We only visited the outpatient clinic, though it also has areas for surgery, delivery of babies, and a communicable disease clinic. As we sat in a darkened hallway waiting our turn, our friends explained that the haus sik, like so many other things in PNG, runs on the wantok system. “Wantok” literally means “one talk”, but it refers to one’s connections (friends, relatives, etc.). First Mathew left us to see if his wantok at the hospital was working, so that I could be seen more quickly. Then Kerry left to go searching for her wantok. And then Rambe searched too, but it seems like everyone’s wantoks had the day off! Finally the teenage boys ahead of me in line saw that I was doomed to wait my turn and they took pity on me, volunteering to let the wait meri (white woman) cut in line before them. I was attended by a nurse at a table in the main room of the clinic – little privacy. The chivalrous boys who let me cut in line got to listen in as I described my complaints to the nurse. I had to buy a health record book – something that every Papua New Guinean must carry with them when they go to a clinic or aid post. In America, the doctor is responsible for keeping your medical records, but here you’re responsible to keep your own! My total charge was 5 kina (approx. $1.60). There is a flat K2 charge for medication of any kind. The health book cost me K3. Although it seemed so cheap to me, my friend Kerry insisted on helping me to pay the bill. 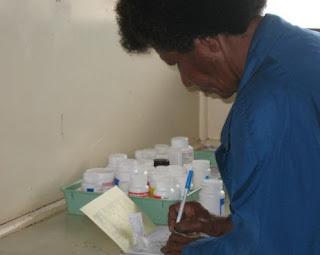 The majority of Papua New Guineans don’t keep medicine of any kind at the house. So that means that if you have an achy back and want some Tylenol, you have to go to the clinic. I snapped a photo of a price list that was posted outside. If your injuries were caused by a fight, there is a hefty K35 extra charge. 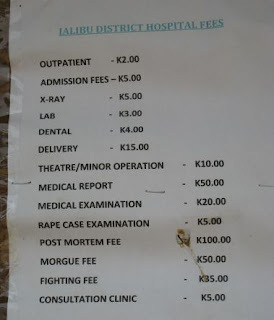 But fillings for cavities are only K5, and delivering a baby costs only K15 ($5.70)! 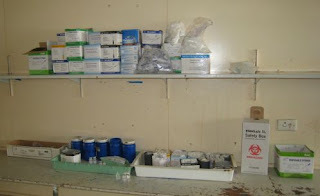 Yes, health care in Papua New Guinea is cheap, but unfortunately many health centers are short of supplies and/or staff. It’s another one of the big hurdles that this country is struggling to deal with. Sounds like a great inexpensive place to start a family. Forget government healthcare here. PNG has it all figured out, imagine if they charged extra if you were injured because of a fight. Great post!